Time Wanderer: Stories of those who came before...: Genealogy Education: NGS's "The Basics"
After years of casual consumption of webinars and blog posts being my main form of genealogy education, I have decided I would like to pursue more formal educational opportunities in the hopes of one day in the distant future achieving certification. However, being a university student currently limits my options mainly to online or local courses due to financial and scheduling constraints. In searching the internet for suitable options, I came across the National Genealogical Society's American Genealogical Studies series. While it is called "American genealogical studies", when I looked at the course syllabi, it seemed to cover fairly general concepts that would also apply to my (primarily Canadian and European) research. So I decided to sign up for the introductory bundle which includes "The Basics" and "Guide to Documentation and Source Citations" for $100. This post will review my experience with "The Basics". "The Basics" has four modules: Getting Started, Creating a Research Plan, Home Sources, and Family Traditions & Connecting with Others. Within these categories, topics covered include: genealogical standards, pedigree vs family group sheet, steps to building a research plan, photographs/clippings already in your possession, evaluating the family Bible, theories and hypothesis, assessing family lore, interview techniques, letters/queries to potential info sources, and social media. The course syllabus is available online. As someone who has been doing genealogy for more than three years, a lot of this course was review of information I had already figured out as I went along. That being said, it was still really helpful to see these various topics formally laid out. The part I found most useful was the module on creating a research plan, as I had never really created an actual research strategy before besides just "find out more about so-and-so". 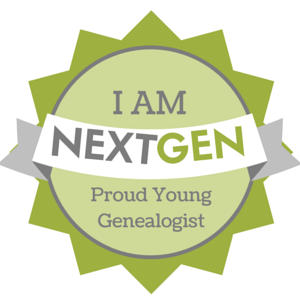 I am looking forward to putting these newly acquired skills to the test soon and hope it will help me achieve success with some of my more complicated ancestors to research. I also enjoyed the sections about evaluating a family Bible and interview techniques.